When the plumbing in your home becomes compromised, and you suspect that you might need to have your pipes repaired or replaced, the plumbing contractors at Integrity Repipe in Orange County can provide you with affordable pipe replacement to give you security and peace of mind knowing that your plumbing will remain in prime working condition. With a variety of repipe plumbing services offered in Orange County, Integrity Repipe can make sure your pipes are replaced with quality and professionalism. Trust our pipe replacement contractors to get the job done. At Integrity Repipe, we pride ourselves in customer satisfaction. With five star reviews on Google and Yelp, we take extra care to make sure our customers are pleased with the work we complete for their Orange County repiping job. 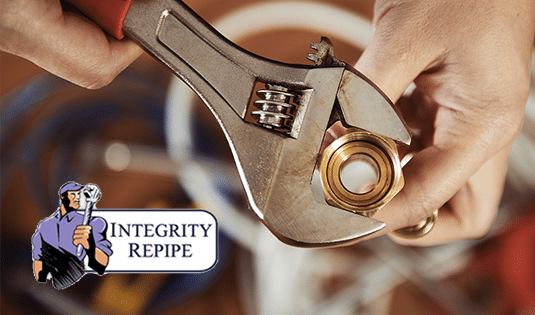 Integrity Repipe has an A+ rating with the Better Business Bureau, ensuring peace of mind knowing that you are getting the best quality plumbing and repiping services in California. Trust Integrity Repipe to take care of your plumbing situation. When you suspect that your home may be in need of new pipes, or that the plumbing in your home must be replaced, Integrity Repipe offers affordable, fast plumbing services near you in Orange County. There can be a lot of determining factors that tell you when you need your plumbing replaced. Your water pressure may be low, your water could be discolored, and your water bill could be unnaturally high. All of these are clears signs that you need a reputable Orange County plumbing contractor to take care of your home’s pipes. Integrity Repipe is proud to provide copper pipe replacement, PEX pipe repairs, and a variety of plumbing services that are dedicated to making sure your plumbing is up to date and in prime working order. When searching for a plumber who can replace or repair the pipes in your home or business, you need someone who is revered by its clients and is licensed to give you quality plumbing services for your Orange County residential property. At Integrity Repipe, we take pride in the knowledge that our clients love what we do and are satisfied with our quality workmanship, whether it is copper pipe repairs, non-invasive leak detection, PEX plumbing services, or any of our other offered services in Orange County. When the plumbing in your home becomes damaged because of years of neglect and strain, the residential repipe plumbers in Orange County can take care of your broken pipes to ensure that they are repaired or replaced with renewed efficiency. For Orange County Repipe specialists who are qualified to repair or replace your current, ineffective plumbing systems, contact the professional plumbing contractors at Integrity Repipe to take care of the pipes in your residential property. As PEX plumbing is quickly growing in popularity, Integrity Repipe remains up to date on new and revolutionary ways to make sure your PEX pipes remain as efficient as ever. Trust integrity repipe and its PEX repiping plumbers to get the job done right. With non invasive leak detection, Integrity Repipe in Orange County is just the residential repiping company to take care of your leaky pipes and and full pipe replacement. Whether you have a copper plumbing system, galvanized pipes, PEX plumbing, unwanted leaks, or any other plumbing problem that needs to be resolved quickly and efficiently, Integrity Repipe is a top rated Orange County plumbing company that is dedicated to making sure your plumbing is in prime working order. With five star ratings on Yelp, you can rest assured that you are in the best of hands when it comes to your home repiping needs. For leak detection, rusty pipe replacement, pipe repairs, and more, trust the plumbing technicians at Integrity Repipe.